J.K. Lasser's Your Income Tax Professional Edition 2019 is the tax preparer's guide to smart tax filing and planning. The Professional Edition not only includes the trusted guidance, clear advice, and money-saving tips featured in Your Income Tax, but also provides citations of tax authorities to help tax professionals easily locate the law, IRS rulings and court decisions that support the text. Fully up to date with the newest changes for 2018 tax returns, expert guidance from J.K. Lasser helps you maximize deductions and shelter income while providing hundreds of examples of how tax laws apply to individual situations. While evolving tax law can get very complex very quickly, this invaluable guide is designed to help you find the answers you need without wading through volumes of the Internal Revenue Code or IRS materials. Special icons call out new laws, IRS rulings, court decisions, filing pointers and planning strategies, allowing you to locate important information without breaking your workflow. Locate authoritative sources easily with citations of references from the Code, the courts and the IRS. Accessible, down-to-earth tax advice is always appreciated, but professional tax preparers need more—such as authoritative sources to back their advice and clarify tricky situations that their clients may encounter. 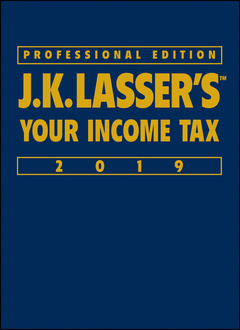 J.K. Lasser's Your Income Tax Professional Edition 2019 provides a quick one-stop resource for every tax pro, merging detailed citations with America's most trusted tax advice for over 65 years. J.K. Lasser Institute has been the premier publisher of consumer tax guides since 1939, when Jacob Kay Lasser first published Your Income Tax. Since then, the guide has been published continuously for over sixty years and read by over 39,000,000 people. The J.K. Lasser Institute also publishes several personal finance books such as Small Business Taxes and 1001 Deductions and Tax Breaks. J.K. Lasser Institute spokespeople are regularly sought after as media tax experts. They regularly appear on such broadcast programs as CNBC, CNN, and Bloomberg TV. They are also often featured in numerous periodicals, including The Wall Street Journal, USA Today, Self Magazine, The New York Times, Newsweek and Reader's Digest.